Governor John Kasich (R - OH) worries that the Kentucky spectacle of Christian extremism will turn people away from religion. He is right to worry. I am disgusted by the un-American, hypocritical, mean-spirited rallies and shows of support for Kim Davis. The whole business besmirches organized religion. Kasich says that when people "see dust-ups like this, my concern is they would go the other way and say, 'Look, I don't want anything to do with that." Lord, I hope so. Do not get me wrong. I do not oppose personal faith or practice of religion. But Kim Davis' rejection of American law has nothing to do with freedom of religion. Her story is being packaged as a Christian persecution narrative, but nothing is stopping that woman from practicing her religion. Religious freedom laws were instituted originally to protect, say, a Muslim woman who wears a hijab. Kim Davis and her supporters have hijacked "religious freedom" to mean "Christian supremacy." Practicing your religion does not give you free reign to do whatever the hell you want, laws be damned. We live in a diverse country. Assuming your religion trumps our core civil laws is arrogant, ugly, and un-American. The Kim Davis Crazies are not at all Christ-like. Christ said absolutely nothing about homosexuality, but he did specifically mention prayer: (Matthew 6: 5) "And when you pray, you must not be like the hypocrites; for they love to stand and pray in the synagogues and at the street corners, that they may be seen by men." Blasting "Eye of the Tiger" at a rally is not what Jesus had in mind. Jesus had some specific thoughts on divorce, too, but Kim Davis conveniently crossed out that part in her Bible. These public displays of hatred toward the gays makes me wince every time I pass a church. I realize that not every church harbors these feelings but, at this point, it does not make a difference. The Christian extremists in this country have done a fantastic job of painting the gays as the enemies of religion. I am gay, so I am going to stay as far afield of these people as I can get. All are welcome? Really? C'mon. I have blocked the name in these photos because I do not want to give the church any free advertising. 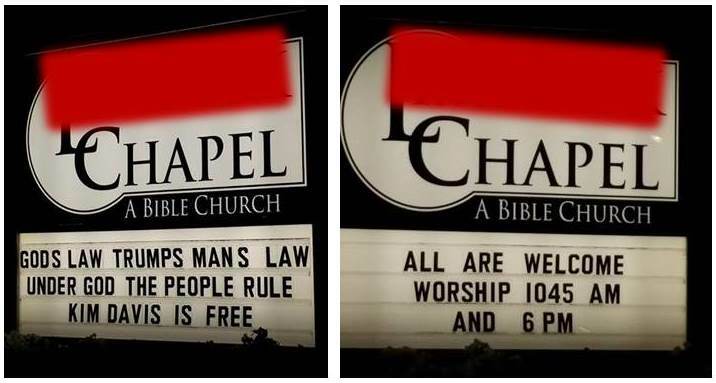 If I left the name visible, the church would probably claim persecution and, the next thing you know, Christian conservative money would come rolling in. We have seen it happen before. A bakery or a pizza parlor announces it will discriminate against the gays and, miraculously, a million dollars is donated to the "persecuted" business. These "Christians" turn a blind eye to real problems (poverty, abuse, war, etc.) and, instead, throw their energies and money into supporting people who flout the law. I do not believe in a god. I certainly do not believe in your God. But, you want to hear something ironic? The closest I have ever come to feeling a loving presence that is bigger than myself was at my wedding (my gay wedding, the day I married another man.) When I walked up the aisle and I saw my husband's face and I felt the warmth and surge of love from our family and friends -- that is the moment that I perceived a glimmer of something godlike. Those "Christians" out there want to bar people like me from getting married and having that feeling. They are purposely pushing me away from wanting to know their God. They claim they are motivated by compassion and love and faith and blah blah blah. Sorry, but once the hypocrisy starts emanating from your mouths, I tune you out. Governor Kasich says that "we have bigger fish to fry in terms of the whole issue of faith." I agree. It would be nice if these "Christians" did more to follow Christ -- you know, feed the hungry, shelter the homeless, that kind of thing -- rather than spending all their time and money to express their virulent hatred toward the gays.